In July of 2015 we upgraded the windows in our condo. Instead of the old, single pane sliders from when the house was originally built in 1978, we now have fancy new vinyl, double pane, low-E awesome windows. I investigated upgrading the windows in the past, since I learned that our neighbor had done hers, but never went past the initial research phase. 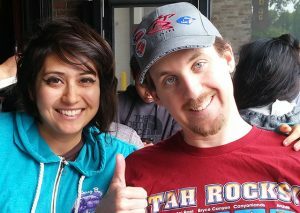 One day, while picking up something else at Home Depot, I started chatting with a person from the HD Professional Services team that was trying to get people interested in new windows. Mostly Alex and I just wanted the free hot dogs and sodas they were providing if you stopped to talk to them for a minute, but ended up actually scheduling someone to come out and measure our house for an upgrade. They came out, measured, ordered, and installed the new windows over the month of July. By that point, it was extremely hot in southern California, and we had been running our central A/C for quite a few days in June. 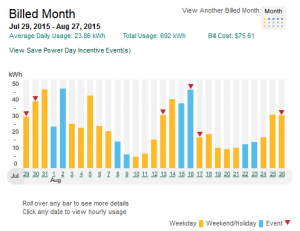 The only thing that really saved us from a huge bill in July was a vacation that kept us out of the house for a week. 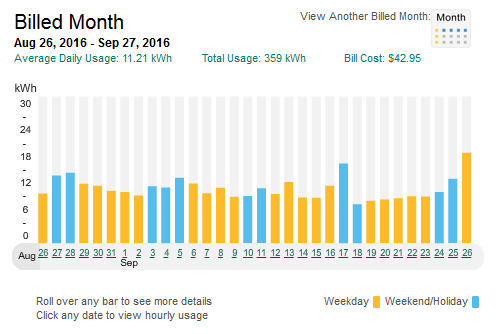 Since we were already accustomed to the temperature the central air was keeping in the house, we kept doing it for the rest of the hot summer, and so our bill was appropriately high each month. 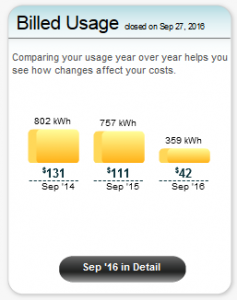 Now that a year has passed, and we can see how well the windows performed for the whole year, it’s surprising how much energy they appear to have saved us so far. Below are some comparisons between 2015 and 2016. Both of these are with the windows installed, but there was a “winter” season between the two that seems to have acclimated us to much lower usage of our A/C. 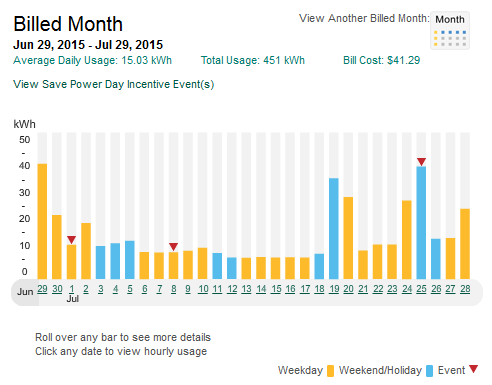 Here we see in July 2015 we used an average of about 15kWh per day, for a total of 451kWh for the month. In July 2016 we lowered our power usage to only 11.25kWh average per day, and a total of 338kWh for the month. That isn’t a big drop overall, only about 25%, but it is significant in relation to the other months. 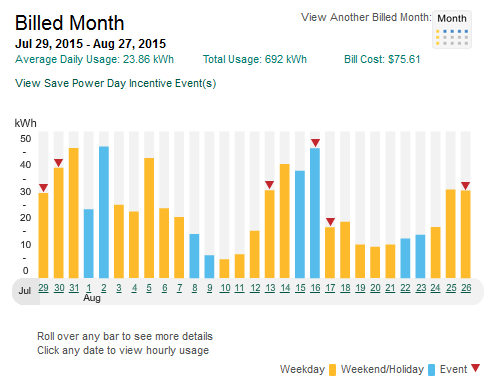 In August 2015, which is historically one of our hottest months of the year, we averaged almost 24kWh per day. That’s really high! The same period in 2016, we averaged 11.5kWh. 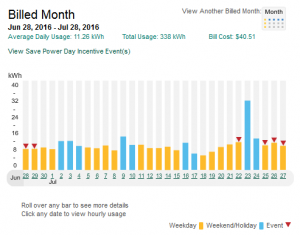 It wasn’t significantly cooler during the month, and you can see by the little red arrows that there were almost the same amount of “Save Power Days,” which mean it was very hot and SCE expected a large spike of electricity (read: A/C) usage in the afternoon. So we can probably attribute this to badassity on our part, as well as the windows are doing a good job of keeping the cooler overnight air inside during the day. Starting in August, I have been riding my bike to/from work every day, which means when I get home in the afternoons, I’m much more acclimated to the hot weather outside. That probably also helped to keep us from running the A/C excessively. 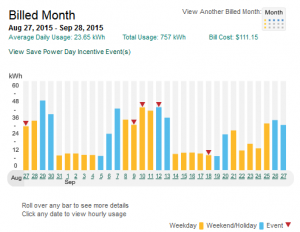 In September, which is usually the hottest month for our area, we see a crazy amount of power usage in 2015. 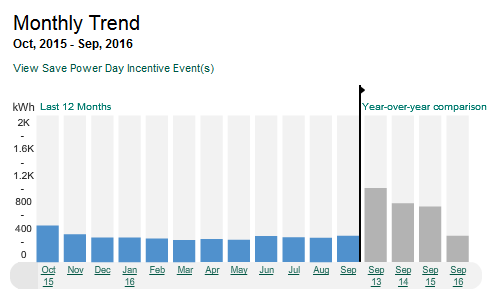 There were 5 “Save Power Day” events during that month, and based on the week of daily spikes between 25-45kWh from September 6-13. Nature threw a wrench in our data this year though by not having many super hot days. As you can see, there weren’t any events. 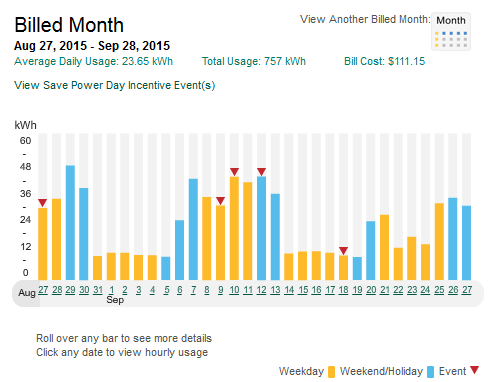 Our average daily usage was down to 11.2kWh with a total of only 359kWh used. Another good view is the monthly trend. 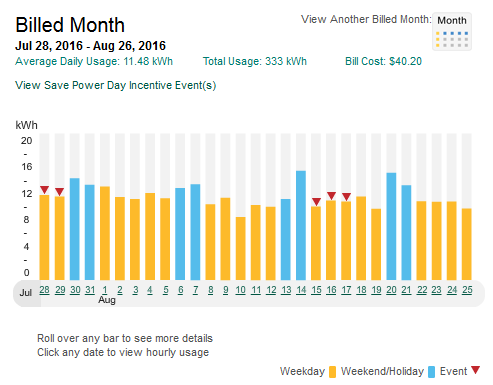 You can see from this graph that we are consistently under then 400kWh mark in 2016. 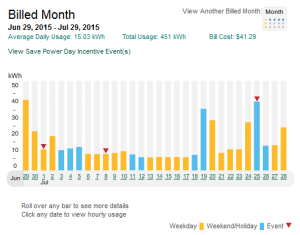 Normally, we’d see a bell curve showing the summer months with noticeably more usage. That just didn’t happen this year, we’re on a pretty flat trend. Also in this graph, there is a nice comparison for the month of September from the previous four years. 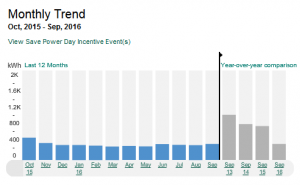 We were already on a downward trend, but 2016 was significantly lower than any of the previous Septembers. Sadly, I can’t retrieve this information for the other months listed. I’d like to see how much better we did during August. 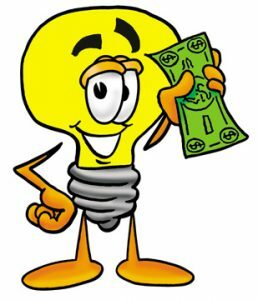 And, finally, the main point of this post, the money savings. 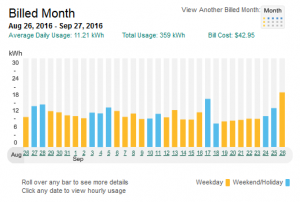 Compared to the previous two years, the bill for this September came in at about 35% of normal. Wow. Frugality for the win. If we can keep this up, and maybe even find more things to cut, next year I might be writing that our bill is even lower than September 2016! 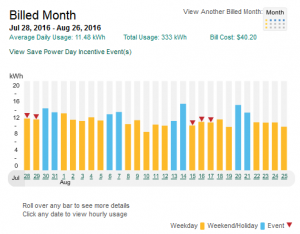 So cutting our power usage has significantly decreased the cost of utilities. This bodes well for our future in Utah, where we might be better at acclimating to the temperature and not running the A/C so much. Only time will tell, but for now, it’s definitely helping us save money and allowing us to use those funds for other, more important things, like vacations.